There is nothing more enjoyable to a child than having a dog to share their lives with. 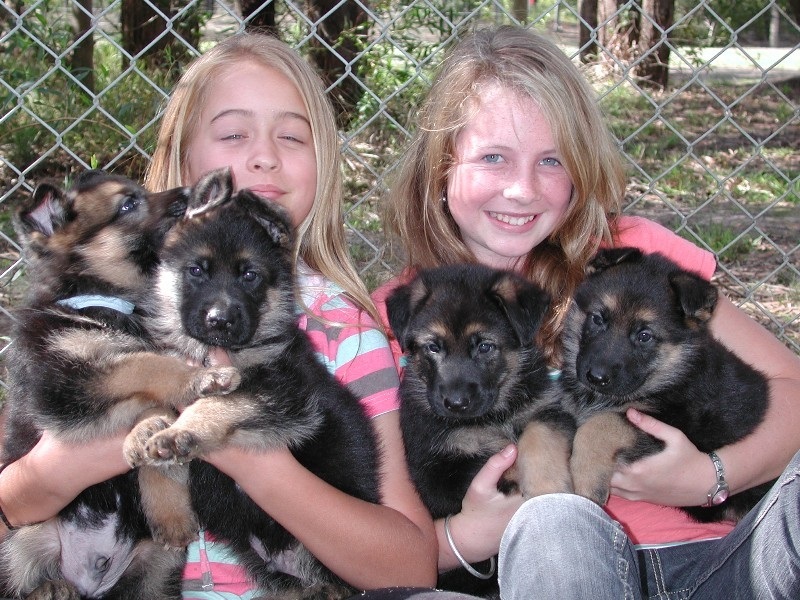 Dogs will teach children how to be compassionate, responsible and considerate to others. If children are taught correctly how to care for and handle a dog, these lessons will stay with them for life. Below, are some helpful safety tips that should be taught to all children to ensure a safe and enjoyable relationship with dogs. *Don’t tease, scream and run about waving your arms – dogs and children learn more in a quiet, calm environment. *Ensure all family members treat the dog the same way as regards behaviour rules. *Teach the children to respect the dog’s own area and toys and bones. *Teach them never to interfere with a dog while it eats, sleeps, chews a bone, is pregnant or has puppies. *’Teach children not to let the dog lick their face and encourage them to wash their hands after playing with dogs and puppies especially before eating. * A dog should never be approached from the rear or silently. Let it see you coming at least give the animal fair warning you are about to approach it, no one like to be surprised !! *A dog should never be slapped or hit with any object for any reason. *Children should be taught to sit on the ground to play with a puppy, supervise them playing together. Never leave a child and dog alone to play together. Adult supervision is essential at all times. *Children and adults should NEVER stare directly into the dog’s eyes, in the dog world this is considered to ” a challenge ” over who is the boss and if it is a strange dog the resulting answer may not be what you hoped for ! *Ask the owner’s permission to pat a dog, let it sniff your clenched hand and pat the dog on the chest, never on the head. *Children should never attempt to lift a dog when it is sick or injured. *Never lean over a fence or into a car ,or enter a yard alone to pat a strange dog. *Never run past a strange dog in the street or run away from it and turn your back. *If a strange dog does approach you, stand like a “Tree”-arms at sides, stand still, look to the side of the dog, make no sound and wait for it to go. * Register your dog with your local council, find out what are the council rules in regards to nuisance and noisy dogs. Make sure you vaccinate your dog and give vet care to your dog when needed. *If your dog is noisy take steps to correct the problem, talk to your local council animal control officers for advice. Seek professional advice from your vet or local obedience school. Dog’s ARE the responsibility of their owners. *Restrain your dog on your own premises, in the back yard and house. *Always have it on a leash when you take it out in public. *Socialise your dog with other animals and people outside the family, ensuring that it is not fearful of these. Your dog must have acceptable manners in society today. *Train your dog to be obedient and to accept humans are its pack leaders. *Do not neglect your dog by chaining it all day or leaving it alone to its own devices, bored or psychologically damaged dogs can become unpredictable. *Spend time enjoying your dog with all the family together. *Neuter or spey your dog – entires are three times more likely to be in the attack lists. *Restrain your dog when strangers come or a new experience occurs, show it how to act normally eg if a workman enters, put the dog in its crate or another room at first. *Teach your dog to sit and wait for the command to be greeted when visitors come. *Never allow your dog to rush up to strangers or strange animals, make sure your dog is restrained. You may think they are going to greet these strangers however it may appear something quite different from your dogs perspective. *Never allow games with the dog that encourage biting or dominance. *If you see signs of any threat from the dog to another animal or a human, seek professional help before it develops further—your vet, a canine behaviourist, or registered trainer can help.